With so many architecture events and interior design trade shows taking place throughout the year, it can be hard to choose which ones to attend. To help you decide we have compiled a guide featuring our top 14 must attend events and trade shows of 2019. The two-day Architect@Work trade fair is aimed at architects, designers and other specifiers with a focus on architectural innovation. Alongside a programme of talks, the event features leading international architectural suppliers showcasing over 200 innovative products. Each year Architect@Work has a different theme. This year the theme is ‘Future-Proof’ which will be emphasising the importance of integrating sustainability into upcoming projects. Surface Design Show is a must-attend event for architects, designers, buyers and specifiers looking to source products, meet suppliers, network, learn from industry professionals, gain new insights and connect with innovative and exciting materials. In 2018, 5,016 professional and trade visitors came to see, compare and specify the latest and most inspiring internal and external surface materials and architectural lighting. The 2019 edition will include 150 exhibitors and 39 presentations on 3 different stages with some 52 speakers covering an exceptional range of topics. Futurebuild is the UK’s single most important built environment event and an inspirational destination for forward-thinking professionals across the entire specification chain. The event is focused on showcasing the latest innovations, products and materials and sharing unrivalled insights to help industry professionals tackle the biggest challenges facing the industry, and beyond, head on. Vision is a conference and exhibition where architects, designers, developers, specifiers and clients can view the latest products, materials and technology in the market. Vision and Futurebuild are joining forces for 2019 in a partnership that will address the key issues facing the architecture and construction industry today. Vision@Futurebuild will be bringing together opinion-shapers, decision-makers and product innovators under a common purpose to explore the latest technologies and approaches, and debate the biggest issues facing the built environment – now and in the future – both in the UK and overseas. Clerkenwell is home to more furniture showrooms, and architecture and design studios than any other district in London. Celebrating its 10th year in May 2019, the award-winning event has firmly established itself as the UK’s leading independent design festival and annually attracts the international design community to this small area of London for three days of exciting events. The London Festival of Architecture is a month-long, city-wide celebration of architectural practice and experimentation. The festival began in 2004, and has since grown to become the world’s largest annual architecture festival. The event attracts a vast public audience – well over 600,000 people in 2018 – and a global media audience of millions. In June the London Festival of Architecture returns to the capital with a lively and diverse programme of public events across London exploring the theme of ‘Boundaries’. Highlights will include a festival pavilion by Pricegore and Yinka Ilori, fusing together African and European design. The Birmingham Design Festival is a celebration of the local, national and international design industry held over three days in June. The festival features a series of workshops, talks, exhibitions, demonstrations and screenings, split into graphic, digital and product “districts”, to various venues across the city. In 2018 thousands of visitors and dozens of speakers from across the globe, showcased 30 venues and celebrated everything the design industry has to offer, from traditional graphic design to animation and special effects, product design to architecture and everything in-between. The festival features hundreds of large-scale installations, exhibitions and events pop up in a wide variety of locations across the capital, from world-famous museums to small local studios. The V&A museum is the hub of the London Design Festival, hosting a wide range of activities, from tours and workshops, to installations and exhibitions. The festival also includes a series of design shows: London Design Fair, 100% Design and designjunction. First staged in 1994, 100% Design is the commercial cornerstone event of the London Design Festival. 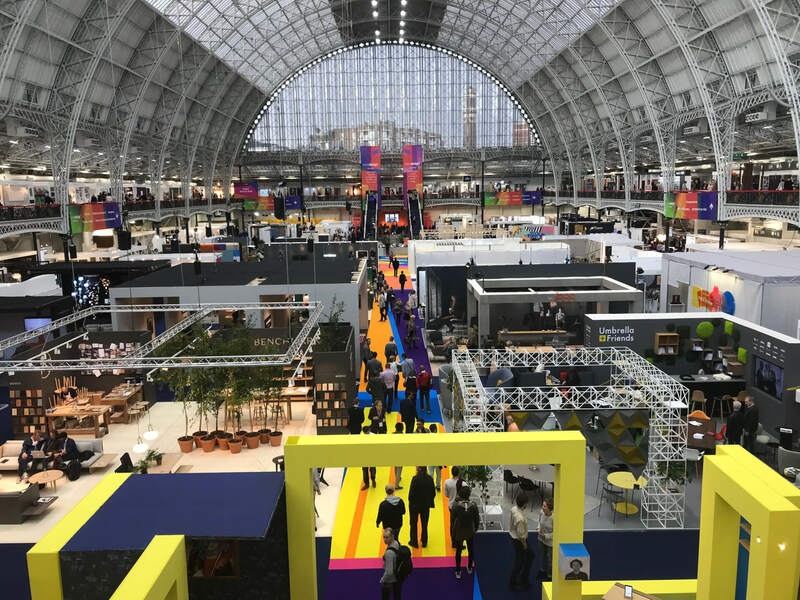 Visitors to the award-winning show, which attracts more than 27,000 visitors each year, include architects, designers, specifiers, retailers and developers looking to source products for their latest projects. designjunction is London’s leading destination for design during the annual London Design Festival. The four-day event connects the world’s most renowned design brands with some of the world’s leading architects, interior designers, specifiers and buyers. Since its inception in 2011, designjunction has continued to break the mould of the traditional trade show by presenting more than 200 brands in a series of inspiring and centrally-located venues, building an unparalleled reputation as the show ‘where design meets’ during the London Design Festival. Alongside its core trade brands, designjunction presents a unique experience by curating a host of design led pop-up shops and bespoke installations. The London Design Fair brings together 550 exhibitors from 36 countries, including independent designers, established brands, international country pavilions, features and exhibitions. As the most international trade destination during the annual London Design Festival over 29,000 influential retail buyers, architects, interior designers, press, designers and design-savvy public attend to see and specify the very latest furniture, lighting, textiles, materials and conceptual installations from around the world. UK Construction Week (UKCW) is the UK’s largest built environment event; bringing together 35,000 construction professionals and 650+ exhibitors to the NEC in Birmingham annually. The event consists of nine shows: Timber Expo, Build Show, Civils Expo, Plant & Machinery Live, Energy 2019, Building Tech Live, Surface & Materials Show, HVAC 2019 and Grand Designs Live. UK Construction Week showcases innovation from all sectors, providing attendees the opportunity to walk away with practical information on new technologies, systems, products and collaborations from around the world that would otherwise take months to research. Surface & Materials Show showcases the latest surface solutions for architects, interior designers, specifiers and industry professionals looking for cutting-edge innovations. Innovative products are the centrepiece of the Surface and Materials Show, which returns to the NEC in Birmingham as part of the built environment’s largest event UK Construction Week (UKCW). Surface & Materials Show showcases an exclusive array of new product launches and creative ideas to inspire designers and specifiers from all parts of the interiors and architectural industry. From colour forecasts to bionic buildings, the exhibition includes topics that anticipate all the major technological, cultural and societal trends. London Build Expo is the leading and largest construction & built environment show in the UK featuring 500+ speakers across 8 conference theatres and 350+ exhibitors across 9 exhibition zones. The exhibition covers the latest construction, development and opportunities in the Greater London region and across the United Kingdom. Taking place at Olympia London, the London Build Expo attracts 25,000+ contractors, architects, specifiers, developers, local councils, housing associations, house builder engineers, suppliers and construction professionals. Have we missed a great architecture event or interior design trade show in our list? Contact us with your recommendations and let us know which ones you will be attending.